Big Joe Turner was one of the great blues shouters of the post-war era, and was one of those artists that bridged the gap from R&B to rock ‘n’ roll, his recordings of “Chains Of Love” and “Shake, Rattle and Roll” in the early ‘50s being precursors of the commercial revolution to come. 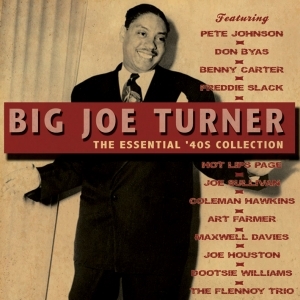 This 54-track 2-CD set focuses on his formative years – a decade and more (the collection includes his early recordings from the late ‘30s) spent working with a variety of line-ups, the consistency and ebullience of his performance and his ability to work with jazz and blues performers alike attracting some of the best accompanists and solists of his time. This anthology combines material previously released on Acrobat’s two “Forties” CDs on the Fabulous label, with another eighteen tracks added, and encompasses a significant number of his important sessions from 1938-49. The booklet provides comprehensive detail of recording dates, titles and musicians on each session. It is presented chronologically to see the progression of his work, although from start to finish, Big Joe just does what he did best – deliver the songs with humour, defiance and joy.